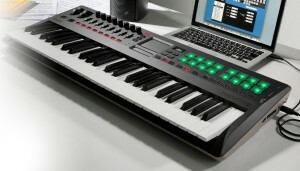 Korg has announced the availability of its new taktile USB controller keyboard. Based on the same design as the new TRITON taktile, but without the TRITON sounds, this is an ideal keyboard for those who want a versatile controller without need of the sounds. Available in two keyboard sizes (two and four octaves) it features a semi-weighted keyboard, touch pad, sliders, switches and pads. It also comes with a range of software which makes it ideal for newer users looking to get established in music production/control. Owner’s Manual, USB cable, KORG BUNDLE SOFTWARE PIN Card.